Happy Monday everyone! I've got a little treat for you this Monday. I was asked by Shabby Apple, an absolutely lovely fashion company, to host a jewelry giveaway. Well, to say that I was thrilled is a bit of an understatement. I was over-the-moon excited to host this giveaway, especially since I know all of you are fashion mavens. They offer a gorgeous array of vintage jewelry, vintage-inspired dresses, adorable children's apparel, stylish maternity wear, and unique home accessories. 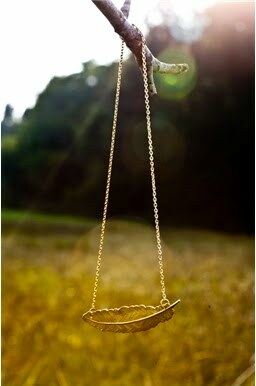 The piece of jewelry that you can get a chance to win is the charmingly versatile Gold Feather Necklace. All you have to do is "Like" Shabby Apple on Facebook and then let me know that you did by leaving a Comment in the Comment box below on this post. You'll not only be entered to win this gold feather necklace, but you will also be notified of any special promotions and exclusive discounts that Shabby Apple offers. But the treat doesn't stop there. They are also offering a 10% discount with the use of this coupon code: PROPERHUNT10OFF. But this discount doesn't last forever, just for 30 days so hurry to their site to use it! So without further ado, please check out their site and see all of the goodies that they offer. Don't forget to "Like" their Facebook page and let me know that you did in a comment. Enjoy and best of luck to all! *You must have a US shipping address to enter, and there will be no exchanges for the winning piece of jewelry. I don't just like Shabby Apple on facebook... I love them! I liked Shabby Apple on FB :).